Astronomers at the California Institute of Technology (Caltech) have discovered that the dwarf planet 2007 OR10 — nicknamed Snow White — is an icy world, with about half its surface covered in water ice that once flowed from ancient, slush-spewing volcanoes. The new findings also suggest that the red-tinged dwarf planet may be covered in a thin layer of methane, the remnants of an atmosphere that’s slowly being lost into space. “You get to see this nice picture of what once was an active little world with water volcanoes and an atmosphere, and it’s now just frozen, dead, with an atmosphere that’s slowly slipping away,” says Mike Brown, the Richard and Barbara Rosenberg Professor and professor of planetary astronomy, who is the lead author on a paper to be published in the Astrophysical Journal Letters describing the findings. The paper is now in press. Snow White — which was discovered in 2007 as part of the PhD thesis of Brown’s former graduate student Meg Schwamb — orbits the sun at the edge of the solar system and is about half the size of Pluto, making it the fifth largest dwarf planet. At the time, Brown had guessed incorrectly that it was an icy body that had broken off from another dwarf planet named Haumea; he nicknamed it Snow White for its presumed white color. Soon, however, follow-up observations revealed that Snow White is actually one of the reddest objects in the solar system. 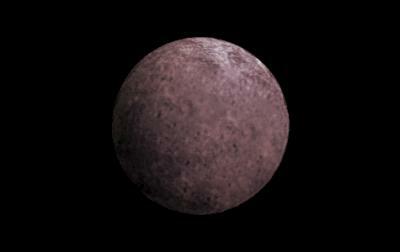 A few other dwarf planets at the edge of the solar system are also red. 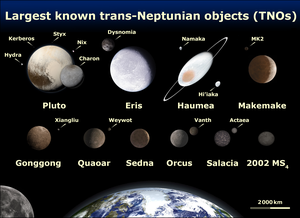 These distant dwarf planets are themselves part of a larger group of icy bodies called Kuiper Belt Objects (KBOs). As far as the researchers could tell, Snow White, though relatively large, was unremarkable — just one out of more than 400 potential dwarf planets that are among hundreds of thousands of KBOs. “With all of the dwarf planets that are this big, there’s something interesting about them — they always tell us something,” Brown says. “This one frustrated us for years because we didn’t know what it was telling us.” At that time, the Near Infrared Camera (NIRC) at the Keck Observatory — which Caltech professor of physics Tom Soifer and chief instrument scientist Keith Matthews helped design in the 1990s — was the best instrument astronomers had to study KBOs, according to Brown. But NIRC had just been retired, so no one could observe 2007 OR10 in detail. “It kind of languished,” he says. Meanwhile, Adam Burgasser, a former graduate student of Brown’s and now a professor at UC San Diego, was helping to design a new instrument called the Folded-port Infrared Echellette (FIRE). Last fall, Brown, Burgasser, and postdoctoral scholar Wesley Fraser used this instrument with the 6.5-meter Magellan Baade Telescope in Chile to take a closer look at 2007 OR10. As expected, Snow White was red. But to their surprise, the spectrum revealed that the surface was covered in water ice. “That was a big shock,” Brown says. “Water ice is not red.” Although ice is common in the outer solar system, it’s almost always white. There is, however, one other dwarf planet that’s both red and covered with water ice: Quaoar, which Brown helped discover in 2002. Slightly smaller than Snow White, Quaoar is still big enough to have had an atmosphere and a surface covered with volcanoes that spewed an icy slush, which then froze solid as it flowed over the surface. But because Quaoar isn’t as big as dwarf planets like Pluto or Eris, it could not hold onto volatile compounds like methane, carbon monoxide, or nitrogen as long. A couple of billion years after Quaoar formed, it began to lose its atmosphere to space; now, all that remains is some methane. Over time, exposure to the radiation from space turned that methane — which consists of a carbon atom bonded to four hydrogen atoms — into long hydrocarbon chains, which look red. Like the frost that covers a lawn on a cold morning, the irradiated methane sits on Quaoar’s icy surface, giving it a rosy hue. Although Snow White‘s spectrum clearly shows the presence of water ice, Brown says, the evidence for methane is not yet definitive. To find out, the astronomers will have to use a big telescope like the one at the Keck Observatory. If it turns out that Snow White does indeed have methane, it will join Quaoar as one of only two dwarf planets that straddle the border between the handful of objects large enough to hold onto volatile compounds, and the smaller bodies that make up the vast majority of KBOs.